Description: Cashland is a business categorized under check cashing service, which is part of the larger category functions related to deposit banking. 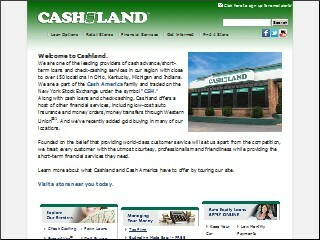 Cashland is located at the address 34280 Vine Street, Willowick, OH 44095 in Willowick, Ohio 44095-5110. The Manager is Jane Vanghi who can be contacted at (440)942-6258. Location & access map for "Cashland"